Phase I of Dennis Wildlife Center construction was completed in 1973 with State appropriated funds and Anadromous Fish Funds from the U.S. Fish and Wildlife Service. The first phase included the administrative building, fish holding house, and thirty-five (35) 0.5 acre ponds. Phase II construction was completed in 1978, and included administration building enlargement, maintenance building, dormitory, two residences, and twenty additional ponds, 1.0 acre in size. In addition to the two major construction phases, facilities have undergone renovations as needed or when funds were available and include: one-half (0.5) acre pond restructuring in 1986; repairs of damage resulting from hurricane Hugo in 1988 to the administration building, fish holding, maintenance building, dormitory, and both residences; pump station construction in 1991; new aluminum risers in eight of the half (0.5) acre ponds in 1992 and 1993; refurbishing of dormitory in 1993. Additional upgrading of ponds and building was completed in 2001. The Dennis Wildlife Center brochure is provided in the Adobe PDF file format. Adobe® Reader® is required to open the above files and is available as a free download from the Adobe® Web site. 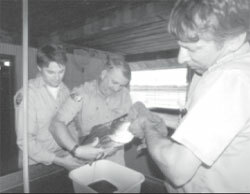 The Dennis Wildlife Center houses many agency functions, but the main objective of the Center is to produce fingerling striped bass and their hybrids for stocking in reservoirs and coastal streams, and to serve as a district office for fisheries, wildlife management and law enforcement operations. The Tailrace Hatchery and eventually the Bayless Hatchery were constructed for the purpose of producing striped bass and their hybrids for public water stockings. The Tailrace Hatchery was the site for the majority of the pioneering research relating to striped bass propagation. With the construction of the St. Stephen Dam and Rediversion Canal the Tailrace Hatchery’s ability to obtain brood stock was reduced by the changes in river flow in the Cooper River. Until the construction of the rearing ponds and facilities at the Dennis Wildlife Center, the agency was very limited in its grow-out capabilities. Most of these function were at different hatcheries which led to production and quality control variations. Water Source: Dennis Center water is supplied by Lake Moultrie with supplemental well water available. Bayless Hatchery water is provided by wells with a water storage tank to insure volume and flow.